Lighthouse faculty is talented. (Don't just take our word for it: seven of our instructors were recently announced as finalists for the Colorado Book Award). So we're especially jazzed when that talent finds a home (cue jazz hands). 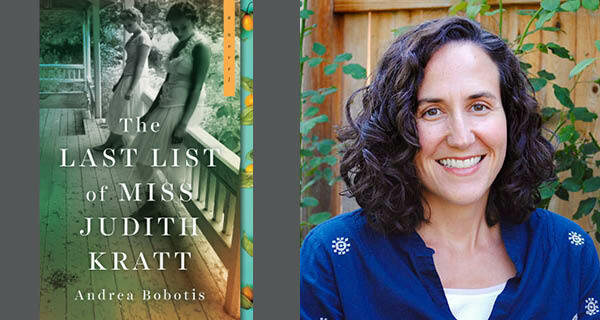 Congrats are in order for Lighthouse instructor Andrea Bobotis, whose debut novel The Last List of Miss Judith Kratt will be released this July, from Sourcebooks. We asked her a few questions, below, about her novel, writing in Colorado, and what teaching has brought to her work. First, congrats on the new novel! How would you describe the journey of writing The Last List of Miss Judith Kratt? And, how do you usually celebrate writerly success? I started the novel when I was pregnant with my daughter. She’s almost nine now. When she was very young, I honed the art of writing in fifteen-minute increments. I decided I would write the best draft I was capable of, whether it ended up published or in a drawer. Having a goal outside of publication helped me stay steady during the many rejections the manuscript encountered along the way. The second part of this question is hard to answer, which makes me realize I need more rituals of celebration! I’m an introvert, though, so celebration for me might be coffee with a friend, a favorite yoga class. Also chocolate, any form. Can you tell us a bit about The Last List of Miss Judith Kratt? What might surprise readers? What surprised you while writing the novel? The novel follows a Southern spinster as she writes an inventory of her family’s heirlooms. Those possessions end up telling a different story than the one she intended, about her family’s troubled history in rural South Carolina. The novel explores the way we engineer family narratives—whether or not they’re true—and it examines how the objects around us that we imbue with meaning have stories to tell about us, too. Readers might be surprised to know that the novel was inspired by a murder that happened in my family two generations before me. What surprised me was how hard it was to turn in the final revision to my editor. I’d lived with that story for so long; I felt immense grief when the process of writing it was over. Breakthroughs, obstacles, light bulbs, rages of writing the book? Yes to all of those. Timelines make me rage. One light bulb for me, structurally speaking, was that I needed to write through emotional turning points in scenes. I had the tendency to retreat from a scene too quickly, breaking away at the very moment when my characters were getting to the heart of it. That piece of wisdom came from Tiffany Quay Tyson, whose Advanced Novel Workshop I took a few years back. Thanks, Tiffany! Where’s your favorite place to write? Is that where most of your writing takes place? My favorite place to write is at my dining room table, which is where most of my writing gets done. If it’s snowing outside and the house is bone silent—those are the perfect conditions. As a Denverite, are there ways (explicit or implicit) that Denver/Colorado show up in your novel, even though it takes place in the South? That is a great question. When I moved out west, I started to see the contours of the South more clearly. Living in Denver gave me a fresh perspective on how I perceived my own Southerness, too. I don’t think I had even processed much of my Southern identity until I moved to Colorado. I’ve considered that the book would have turned out pretty differently had I finished it while living in the South. Which writers/artists/foods are you really into right now? I just finished Colson Whitehead’s The Underground Railroad. While reading it, I simultaneously felt distress that I hadn’t read the book earlier and sorrow that I would soon be done reading it. Whitehead’s narrative gifts are immense, especially the reach of the book’s narrative voice, in which allegory and realism coexist and the sweep of history makes room for the intimate. I’m in awe. I also recently enjoyed the historian Elizabeth Catte’s book What You Are Getting Wrong About Appalachia. The book is a rebuttal of J. D. Vance’s Hillbilly Elegy. Catte is really smart on how Vance’s narrative of the white working class deflects attention away from discussions of racism. And I just started Mark Mayer’s story collection, Aerialists, which I’m having a hard time putting down. Mayer’s stories deliver truths about human interactions in a way that is at once shrewd and tender. His writing is both formally daring and emotionally capacious, which is a rare combination. You teach in the Youth Program here at Lighthouse, how has working with students influenced your writing? I often ask my students why they write. Not long ago, a student responded that she writes because it’s easier than talking. It was just such a lovely and honest answer. (And I can relate!) That encapsulates why I like working with young writers. They have a clear understanding of their impulse to write. In adulthood, that self-awareness can get cloudy. My students remind me that for so many writers, the written word is our primary way of processing the world. The Last List of Miss Judith Kratt comes out in July, will you be doing a book launch, tour? Any particular places you’re especially excited to visit? My book launch will be at Tattered Cover (Colfax) on the evening of July 9, which is also my official publication date. Exciting! I’ll be doing a couple more Colorado events, and then I’ll head to the South for some readings. I’m most excited to read in my hometown of Greenville, South Carolina. That’s where I started to write, after all. Full circle feels good. Andrea Bobotis's debut novel The Last List of Miss Judith Kratt is forthcoming from Sourcebooks in 2019. A native of South Carolina, she holds a PhD in English literature from the University of Virginia, where she was honored with the All-University Graduate Teaching Award. Her fiction has received awards from the Raymond Carver Short Story Contest and the James Jones First Novel Fellowship, and her essays on Irish writers have appeared in journals such as Victorian Studies and the Irish University Review. She lives in Denver, where she also teaches yoga and spends time with her family.